The audio obtained in March took precedence over the trip reports and a few other things I’ve been meaning to address for some time. They’re worth a listen if you haven’t done so already. Longtime readers of the blog have probably noticed the donate button and the advertising that now appears on the site. Project Coyote has been mostly self-funded from the start, except for a few donations from anonymous individuals and the Rapides Wildlife Association. Some used equipment has been passed on to us by other groups of searchers. I’ve long believed that we’d be able to document ivorybill presence (or go a long way toward ruling it out) with more consistent coverage in the area and a relatively modest budget. At this point, remote recording units and a couple of additional cameras are at the top of the wish list. Ultimately, I’d love to be able to cover costs for our core group and to provide funding for one or two people to be in the area steadily, at least during February, March, and April. I can dream . . . Anyway, your contributions can help make some of this possible. Before Frank’s passing, I had decided to ‘retire’ from active searching after this season, for a number of reasons – the sense that I had nothing further to say about feeding sign and the fact that I did not personally see or hear anything strongly suggestive of ivorybill presence in the 2015-2016 season among them. The lack of recent work on hickories was particularly discouraging. Things started to change when Frank was in the hospital. It became clear that our search was important not only to Frank but also to his family and friends. A number of long-time, mostly quiet, enthusiasts and supporters (including Matt Courtman who had visited the area with Frank some years ago) reached out and encouraged me to continue and even to intensify the effort. Shortly thereafter, Phil Vanbergen found some recent scaling of the kind that I think is diagnostic for ivorybill on two hickories, though it turned out the work was not as fresh as initially suspected. The trail cam capture of a PIWO removing a strip of bark from one of the trees led me to begin my first March trip in a somewhat pessimistic frame of mind. It didn’t take long for that to change – another ride on what I’ve taken to calling the IBWO-llercoaster. I was on my own on the 10th and had a slightly less discouraging day; I got my first opportunity to examine the scaled hickories Phil had found. This strengthened my suspicion that the recent PIWO work was “wake feeding”. Later, I met Matt for dinner and a strategy session. Everything changed on the 11th. In addition to satisfying myself that the extensive scaling on the hickories was at least several months old and that the recent Pileated activity was likely secondary scaling (based primarily on the small bark chips); over the course of the day, we deployed three of our four trail cameras. Even more importantly, we had auditory encounters in both the morning and the afternoon. Here is my write up from that day, with a few redactions. At about 10:15, we were in close proximity to where we’ve had several possible contacts, most recently when I was out with Frank in October. We’d just deployed a second trail cam, and Matt had gone about 50 yards north and west of Phil and me. He texted and asked if he could do some DKs (he’s using two wooden blocks that he knocks together.) He did several, no particular pattern, mixed ASKs in with the ADKs. I did not take notes, and my memory of the exact sequence is weak, but I heard 5-6 DKs and SKs coming from the east in response. If I remember correctly, there was at least some interplay between the ADKs and the DKs, meaning that there were a couple, and then a pause, then Matt DK’ed and there were replies. Matt said he heard 4-5, and I think Phil said he heard 3-4. Whether or not I’m misremembering, it was far and away the most compelling series of responses I’ve ever heard, and I’ve done hundreds of ADK sessions. **** this was similar to what you encountered on your first trip, in the same general vicinity, but a lot more dramatic. In addition, there was no ambient foraging, and other than the responses, all we got was one PIWO drum from a different direction. Phil said that one of the DKs was very similar to the Pale-billed DKs he heard in Costa Rica last summer. For the kents, we were at a different location a few miles away; the time was approximately 2:45 pm. Phil and Matt heard a number of calls, of which I only heard two. Of the two I heard, the first was on the low-pitched side, I’d say close to the pitch of the what Tanner called “conversational” calls on the Singer Tract recordings or what Frank and I called the “wonka wonkas”; it had a trumpet-like quality, maybe more than I’d expect for an IBWO, but still in the ballpark. The second was higher pitched and more tooty/reedy, very close to the Singer Tract recordings. The wind was dead calm for the second call, so it was not a tree squeak. In both cases, the calls came from the East. So there we are. Quite a day. Now, if we could only find out what’s making the sounds and what’s knocking the bark off the hickories at the outset. For those who missed it, here’s Phil’s recording of two of those calls – headphones or good speakers recommended. We did not record the knocks we heard in the morning. On the 12th, Steve Pagans, Matt, and I returned to the location and heard 1 ambient DK and 2 SKs, at approximately 1:55 pm. These sounds came from roughly the same direction as the calls we’d heard the day before. The possible DK was not as loud as the SKs, or as yesterday’s knocks, but it was distinct. Matt did some ADKs. There was a Red-bellied Woodpecker foraging to the south of the direction of the knocks. Matt’s ADKs seemed to induce it to bang more frequently and forcefully, but we didn’t hear any distinctly IBWO sounding knocks in response. Steve and I heard a single possible kent from the same direction as the possible SKs and DK. It was faint. Steve heard it better than I did and thought it was good; Matt didn’t hear it all. This was probably due to how we were positioned in terms of proximity to the sound. Under normal circumstances I’d label this episode as a fairly weak possible, marginally worthy of mention on the blog. But given the location, it seems more significant. The 13th was also eventful. Matt and I opted to return to the area where we’d heard the knocks on the morning of the 11th and give the other location a rest. Here’s my write up of the morning’s possible auditory encounter. We decided to do a mix of playback and DKs at 9:40 AM. I did about a minute and a half of playback, using the iBird app (3 rounds – 28 seconds of Kents, “conversational” calls, and tapping). Matt followed with perhaps a minute of knocking wood blocks together. Over the course of the following five minutes, we had several knocks. Initially, Matt heard a single that I think I missed. It was followed by a very loud knock coming from the East. It was VERY loud and clear, what Frank would have described as some banging on a tree with a baseball bat. Shortly thereafter, another sound came from my left, roughly north of us. Matt heard it as a single, but I heard it as a double, with the second to my ears perhaps the closest thing to what Tanner described as an echo of the first I’ve ever heard. After that, we heard another loud single roughly from the southwest. The last was more distant and somewhat less striking. The first single knock and the one I heard as a double were astonishing. There’s no doubt in my mind or his that these were neither mechanical sounds nor foraging. I am kicking myself hard for not having my recorder running; I’ve gotten too jaded about auditory encounters, and it’s a little tough to manage both recording and generating sounds. A little later, I found a dying chestnut oak with some mildly intriguing feeding sign. There were some huge, thick bark chips on the ground and this, more than the appearance of the work on the tree, struck me as potentially suggestive; this is the first interesting work I’ve found on an oak in several years. Matt and I returned to this location on the morning of the 14th. Matt did ADK series on the half hour until shortly before noon. It was a cold and windy morning, uncomfortably so. We heard nothing of interest. On the 15th, I headed for New Orleans and my flight the following morning. Phil and Matt returned to the woods and captured numerous calls between 7 and 11 am. When I heard the recordings I cleared the decks and made arrangements to return as soon as I possibly could. Patricia and I were back in the woods by lunchtime on the 23rd. Louis Shackleton – a good friend, professional photographer, and birder who happened to be in Louisiana – joined us on the 24th. We didn’t see or hear anything of interest and left early ahead of predicted heavy rains. At shortly after 11:00 am on the 25th, Patricia and I heard some possible double knocks in apparent response to some very aggressive knocking on my part; two of these knocks came from roughly north and one from the east (the same direction from which the March 15th calls were coming). I’m still reviewing the audio from this trip and may have additional material to post in the future. I went out alone on the 26th, returning to the same vicinity, and did not see or hear anything interesting. We were rained out on the 27th. On the 28th, I found a large cavity not far from where the calls were recorded. It does not appear to be fresh enough to be a recent nest, but we plan to target it with a trail cam in the event that it’s being used as a roost. This find illustrates how difficult it is to spot cavities in our search area – six people had spent the better part of multiple days in the immediate vicinity before I noticed it, and the snag is in plain view. More storms came through on the night of the 28th, and the next morning Patricia and I decided to take a break from the “hot zone” and instead visited the area where Phil found the recently scaled hickories and where Matt, Phil, and I had heard knocks on the 11th and 13th. We found that one of Phil’s scaled hickories had lost its top, which gave me a chance to examine one of the scaled areas up close. As expected, the wood was somewhat punky, and and the bark was fairly easy to remove by hand. We also discovered that the top of one of our target hickories had been blown off. 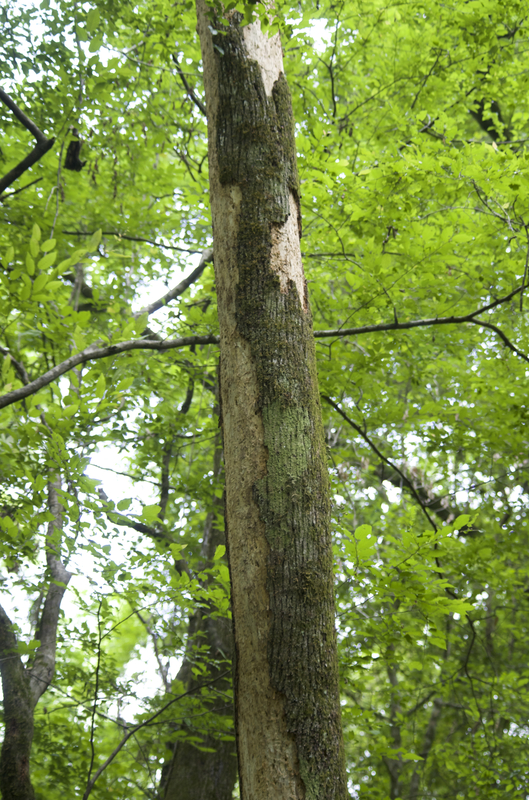 The tree shows signs of beetle infestation, which gives us reason to hope that it will be visited by woodpeckers before too long. It was interesting to get a close look at this freshly fallen top and examine how hickory bark separates from the trunk under these circumstances. While it seems to come free fairly easily in very large strips, the bark is extraordinarily tough and strong. When fresh, it’s flexible but very hard to break; doing so requires twisting, and it won’t fracture. Within about 48 hours the piece I collected had dried out and become surprisingly hard. This further reinforced my view that Pileated Woodpeckers are not anatomically equipped to scale large chunks of bark from live or freshly dead hickories. It was a beautiful day in the woods, and some of the other highlights included recently hatched Wood Ducklings, a posing Yellow-crowned Night Heron, and the first ‘gator (a small one) I’ve ever seen in the area. The next morning, I returned and redeployed a second camera, which had been trained on another nearby hickory, to the one with the downed top so that we can cover the entire stub. We spent the morning of the 31st in the area where the calls were recorded before catching an afternoon flight. We did not note any interesting sounds while in the field, but after listening through Patricia’s recordings, I noted the possible double knock discussed in the previous post. I’m planning two more trips before summer. I anticipate that we’ll have all cams deployed and have high hopes for the hickory stub. Meanwhile, I thought I’d throw in some additional images that may help to convey what a special and magnificent place this is. Part 1 of this report is here. Patricia opted to take the day off on the 19th, so I went out on my own and covered a lot of territory. I had been thinking hard about the hickories and the fact that, in virtually all cases, we’ve seen indications that bark is removed from these trees and stubs within a very brief period or perhaps in a single visit and that other woodpeckers don’t seem to begin working heavily on these trees for extended periods, sometimes for years. Except for changes in color due to exposure to the elements, some of the scaled surfaces we associate with Ivory-billed Woodpeckers can retain their distinctive appearance for at least three years and more likely five or more. Steve Pagans later explained that this is due in large part to hardening by compression; hickory wood is hard and dense to begin with, and when a tree or stub is leaning, the wood that’s absorbing more weight becomes even denser, harder, and more impervious to rot. Thus, on many of these trees, Pileated Woodpeckers will have worked on the rotting side, sometimes extensively, while the compressed side remains very hard and virtually untouched by woodpeckers. I examined and marked as many of these trees as I could over the remainder of the trip. Unfortunately, we did not find any of this scaling in the 2015-2016 season. Trying to find more of it this year and trying to find a way to identify potential target trees before they’re scaled will be priorities for me. I plan to write about this work on hickories and what I think it suggests in an upcoming post. For now, suffice it to say that these particular snags and stubs are a kind of twofer having the decayed substrate that’s preferred by Pileateds and and the hard wood that, following Tanner, is preferred or used exclusively by ivorybills. As noted elsewhere, some bark on these snags and stubs can remain tight for years, and on one of the trees I examined, it was still difficult to remove, even when it had reached a point at which some of it would crumble to powder when it was being pulled off. More importantly, the harder surfaces show modest expansion of exit tunnels and targeted digging work that appear to be associated with the initial scaling (as in the hickory on the homepage and the one in Steve’s photo at the end of this post, both of which were very freshly scaled and alive when found) and little or no other work for a period of years, even when there are signs of infestation by multiple insect species (based on the presence of exit tunnels that vary greatly in size and shape). I’ve included multiple examples, long shots and details, to illustrate. On the 20th, Patricia, Steve, Phil, and I went to Sector 2 together. We went through the area where I recorded calls in 2013 and where we found concentrations of scaling in spring 2012 and during the 2012-13 season. There has been none since in this little patch. We found no recent looking bark scaling in the morning (as it turned out, we missed a group of three sweet gums with high branch work perhaps a quarter mile to the northeast of this area, see below.) One odd highlight was coming across a patch of forest floor with many of these beautiful ice formations that had formed around the stems of a couple of species of plant. At a little before noon, Steve opted to turn back; we had already covered 2.3 miles. Before we went our separate ways, we all speculated on and were baffled as to what might have damaged this sweet gum. The wounds seem to have been caused by a scrape, but there were no downed trees or tops anywhere in the immediate vicinity. Phil, Patricia, and I proceeded another half mile farther north, reaching a hickory stub that I found in the spring of 2013, shown below. The stub was still standing, and the areas with putative ivorybill work had lost more bark but showed no signs of further woodpecker activity. The presence of a click beetle in this 2013 photo suggests that parts of the tree were already starting to rot even then. We found two sweet gums with extensive scaling on large branches within 30 yards of this snag. Some of the work was recent. This is something that we’re finding repeatedly; even within clusters, the interesting feeding sign often seems to appear in tighter groupings involving two or more trees. I’ll provide a possible explanation in my next post. We found a particularly unusual bark chip at the base of the tree on the left. While it comes from a relatively small branch, the way it was removed may be significant. Over 1/3 of the chip is cylindrical encompassing almost the entire circumference of the limb; it was not pecked off piece by piece; instead, it appears to have been loosened by several blows and then pried free. The bark is hard, suggesting it was tightly attached; it was moist and contained a good deal of frass when found. The piece is very large, approximately 13″ long and nearly 7″ in circumference. 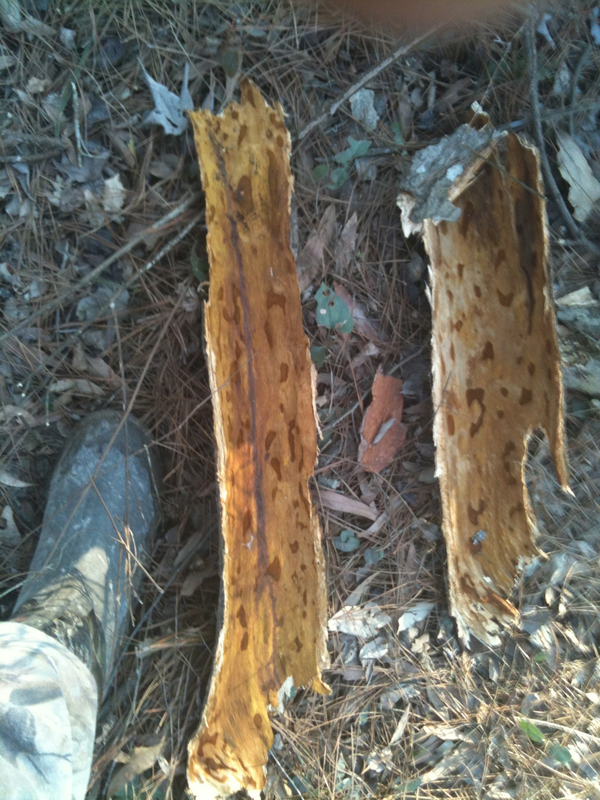 On the return trip, we found a small group of three sweet gum snags, somewhat on the longer dead side. All three had recent to fresh scaling, and there were very large bark slabs at the bases of two of them. These slabs of bark were dense and hard, suggesting that they were tightly adhering when stripped. We came across a massive relict cypress on the way back. It’s not the first time I’ve seen this tree, but it never fails to take my breath away. On the morning of December 21st, Phil and I went to Sector 1, and Patricia and Steve went to Sector 3. We decided not to deploy a camera on the downed top we had found on the 16th. We have two functioning cameras at the moment, and it seemed more prudent to deploy them on untouched substrates. We didn’t find any new scaling or a substitute target, so we decided to head for Sector 3 where I had a couple of targets in mind. As we were walking to the car, I got a text from Patricia saying that she and Steve had just had a possible auditory encounter. Steve is a dedicated birder with very good hearing and excellent ear-birding skills. Patricia has limited experience, but she is a retired opera singer with a good general ear. Here are their descriptions of the morning’s events. Steve: At about 9:10 am, Patricia and I were in the bottomland hardwood area in Sector 3. The weather was overcast and cold without any wind – very good conditions to hear bird calls. We had walked southward for about a quarter of a mile in the bottomland area when we had decided to do some DKs. Actually it was Patricia’s idea to do some DKs, and we proceeded to find a small American Holly that was the right size to cut two sticks for knocking. Steve: The location is one where we could see for a distance fairly well. When we started the DKs, we did not keep up with how many were done or how long we did them, but I think it was for about 10 minutes. We made an effort to keep watch for an incoming IBWO that would be responding to the DKs, but we were probably not as diligent as we could have been. At a point we had engaged in some conversation. I was sitting on a sweetgum log and Patricia standing about six feet away. My right side was facing south. Patricia was talking when all of a sudden I heard what sounded like at least two distinct calls from my right. The calls sounded like textbook calls of the IBWO – a bit like a toy horn was being blown. I know White-breasted and Red-breasted Nuthatch calls very well and what I heard did not sound like either of those birds. I immediately put up my left hand to stop Patricia from talking and pointed with my right hand toward the south. I told her what I had heard while we both strained to hear any more calls. There were no more calls. Also, we did not see the bird. It is highly likely that we did not spend enough time watching and listening for the bird after I had heard it call. It is hard to say how close the bird might have been to our location because I don’t know how far their call can be heard. Patricia: I think I did about 10 DKs, perhaps 15-30 seconds apart. When I didn’t hear anything interesting,I joined Steve, who was about 20 yards away. We started talking, and I was responding to something he said when his hands went up and his eyes widened. He whispered, “Did you hear that? Kent calls?” I shook my head no. We listened for a while, but probably no longer than 5 minutes. Steve suggested we do another round of DKs to see if we could call in whatever made the sound again. I asked him to do the next round, as I my hands were stinging and sore; plus I wanted to hear them from someone with more experience. I think that, should someone have an auditory encounter, another person should take their place during a second round of DKs. I stayed where I was standing when Steve heard the kents but was facing directly south. After 3 or 4 DKs, I heard something similar in cadence, but it had a sharper, crisper quality to it (similar to recorded Campephilus double knocks). It came roughly from the southwest. By the time Steve joined me later, I had convinced myself that it was caused by the logging that we heard going on in the distance, also to the southwest. If I mentioned hearing the DK to Steve, I probably downplayed it, blaming the logging or a falling limb; the winds were very calm at the time, and I didn’t hear any similar sounds from the logging that morning. I have not spent much time in the field and am reluctant to place too much weight on my observations. I’d much prefer the IBWO (should it be out there) land on my shoulder “Sonny Boy” style and leave behind a fine DNA sample, after I manage to take a series of selfies! Don’t we all . . . or at least that we could call them in like Barred Owls. We met up with Patricia and Steve, and Phil set up the cams; one is currently aimed at a sweet gum stub we targeted last year before losing a camera to flooding. There is some fresh woodpecker work, I suspect Hairy, on the stub, so this may be a good time to target it. The other cam is trained on both a downed sweet gum top and a longer dead snag. Both are within the area where we’ve had multiple possible encounters recently, not far from the heavy concentration of sign found last spring. Toward the end of the day, Phil went to do an evening stakeout in sector 1; Patricia went with him, while I took Steve a little farther north to show him a couple of the hickory stubs. In this location as well, there were a couple of recently scaled sweet gums in within 20-30 yards of the older hickories, which were similarly about 20-30 yards apart. 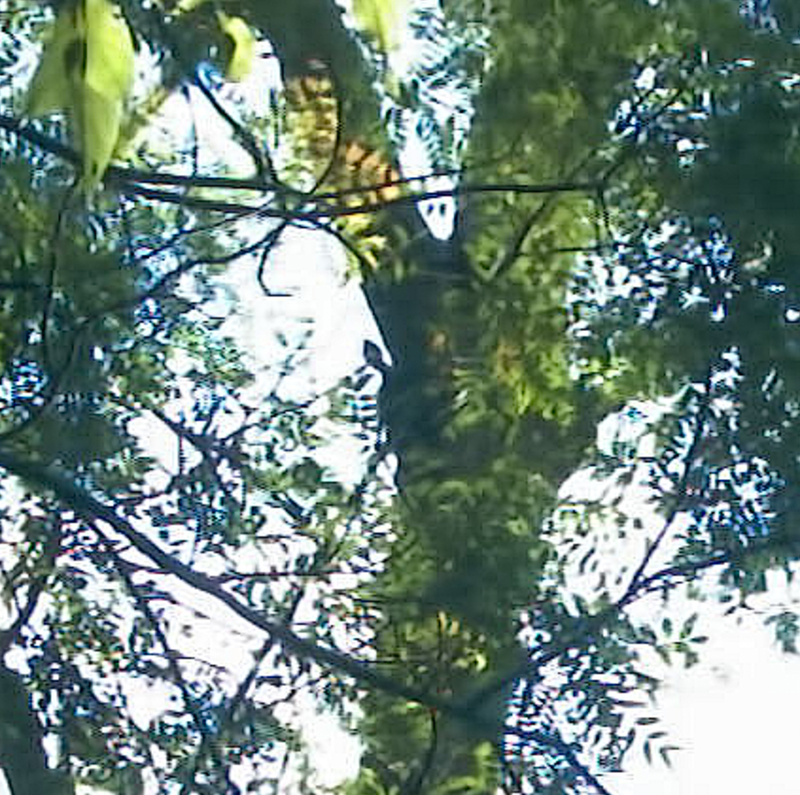 We also examined one of the hickories Steve photographed in 2013; it was alive at the time. This one had decayed somewhat more rapidly than many of the others I’ve found, but it’s at a lower elevation relative to the nearest water body. Steve remarked that he’s never seen feeding sign like this anywhere else, and he has spent countless professional hours in bottomland hardwood forests. Frank, Phil, and John Williams will be in the search area over the next few days, so there may be another report coming soon, in addition to the post I’m planning on hickories and foraging behavior. This was an eventful trip, with an extraordinary amount of activity on the first four days – including a possible sighting and several possible auditory encounters – and none at all on the last two. I was alone on October 13th, 17th, and 18th; Frank joined me from the 14th-16th. Conditions were generally good – light winds (strongest gust, 20 MPH, was on the 13th) and sunny or partly cloudy skies. Daytime highs were in the upper 80s-low 90s, with uncomfortably high humidity on 17th and 18th. Notwithstanding the recent flooding in Louisiana, the forest floor was dry and water levels were lower than I’ve ever seen, making it much easier to reach less accessible areas. I found very little fresh scaling, although a tree on which we had a trail cam appeared to have been worked on quite extensively sometime after my last visit in late May. The card probably contains imagery through June and possibly into July. Unfortunately, it may have been corrupted; Frank is working on retrieving the data. If I were superstitious, I’d point to this as another case of “the curse of the ivorybill”. That aside, the paucity of fresh scaling (only a few trees with small chips consistent with PIWO work at the bases) supports the idea that bark scaling has a seasonal component that is related to breeding. This is implicit in Tanner, the limited data on ivorybill stomach contents, and in several previous posts (links). I am somewhat hesitant to mention and describe my possible sighting and some of the other possible encounters this trip but have decided that it’s better to be comprehensive and transparent. Of all the events of the past several days, I think the double knocks Frank and I heard on Saturday were the most compelling. While my views on the IBWOs persistence are unchanged, my pessimism about obtaining conclusive documentation has grown. I may have more to say about this in a future post. And with that, here’s the day-by-day log. I arrived in Sector 3 at sunrise on Thursday morning and got to the ‘hot zone’ as quickly as I could. I went a little farther south to the trail cam and noted that one of the target trees had been more extensively scaled since my last visit in May. The work is on the bole of this less than 1’ DBH sweet gum that had been damaged by a falling limb and has recently succumbed (photo below). There were large chips on the ground, but they did not appear to be fresh. If the scaling was done in June, as I suspect, we hope to have captured the source. I hunkered down and watched the trees for some time, seeing and hearing nothing of interest. When the sun was above the tree line, I ventured south and east, thinking I’d take advantage of the low water and explore some unvisited areas. I had a possible sighting at about 9:25. I was walking south and turned to my right, looking across a clearing to a large snag that I estimated to be approximately 200 yards away (paced off at over 170 steps and later rangefindered at 160 yards). The snag in question is very close to where Frank had a sighting in March. I texted my wife with a description that I fleshed out in an email that evening, bracketed remarks have been added for clarification. “I saw a brilliant flash of white as a woodpecker flew up onto the tree [this was a dorsal view.] I reached for my binoculars not my camera; I think because the distance was so great. I got the bins on the bird and got them focused as it took off. I didn’t get anything like a good look, but again saw brilliant white wings with a little black. I also had the distinct impression that the bird was much too large to be a RHWO. But it was a fleeting glimpse (or better two fleeting glimpses). I did some playback of PIWO and IBWO and had no responses. I . . . went to the snag. There is a RHWO roost at the very top, and I saw one juvenile and another RHWO but didn’t see the head [and could not determine whether it was a juvenile or an adult]. Though RHWOs were present, seeing them at this close range made me feel even more strongly that the bird I spotted was much bigger. I can’t fully rule out RHWO, but I also find it hard to imagine that I would have been able to get any details at all such a distance unless the bird was large.” Snag where I had the possible sighting. The bird landed on and took off from the stub at center. A Red-headed Woodpecker cavity is at the top of the left stub. My view was dorsal and from below, so the white was clearly on the trailing edges of the wings, ruling out Pileated. This was my first possible sighting in almost three years. I was disoriented and shaken by it, as I have been with my handful of other possibles. And since it was not a good look, I can’t help but doubt myself. As it turned out, Frank and I were able to spend some time observing Red-headed Woodpeckers in an open area at 50-100 yards. This was on Sunday morning at approximately the same time and under lighting conditions that were, if anything, somewhat brighter than those on Thursday. These observations led me to lean somewhat more strongly toward Ivory-billed Woodpecker. While the white rump of the Red-headed was easily visible at these distances, the white on the wings at a similar angle of view appears a lot less extensive and vivid than what I saw, and Red-headeds indeed look quite small. I was able to capture a female Pileated and a sub-adult Red-headed in several frames. I’ve included a couple of the images here, both because they illustrate the size differential and because the posture of the Pileated is very similar to the posture of the bird in one of our old trail cam photos; the angle of view is different; nevertheless, it seems relevant with regard to neck length. The snag was less than fifty yards away. The first photo in the series shows the entire area. Frank measured the distance to the distant snag at right as 100 yards; the snag in the second and third images is at the left edge of the frame in the first. On Friday morning, Frank and I had hoped to return to the ‘hot zone’, but when we arrived another vehicle was parked at the end of the road, presumably a squirrel hunter. To avoid contact with others, we went to Sector 2 but found another vehicle parked where we were hoping to hike in. We opted to hike into Sector 3 from the south, a part of the area that we visit less frequently and that’s harder to traverse when water levels are high. I did not note the time, but I’d estimate that it was between 9:00 and 10:00. Frank did a series of double knocks, and shortly afterwards, I heard two single knocks (Frank heard one) and then a possible distant double knock that we both heard. Later on, farther north and closer to the ‘hot zone’, he did another series, and there was a loud, close single knock, followed by what may be the longest and most agitated-sounding Pileated calling I’ve ever heard. We both found these knocks somewhat intriguing, but neither one of us thought they were compelling. We stopped and waited, and heard nothing. Frank did an ADK series and got no response. About fifteen minutes later, I did another series, and this time, I heard 2-4 more double knocks. Frank was applying insect repellant, the reason for my uncertainty about the number of knocks I heard. He only heard one. We sat for another 20 minutes or so, and, after hearing nothing, proceeded south to the scaling concentration. When we reached the pond with the downed cavity, we heard another DK from the south, at fairly close range. From there, I took Frank to where I was standing when I had the possible sighting, and he measured the distance. We then went on to explore some previously unvisited places, finding some possible cavities and starts and a little bit of older feeding sign. This part of our search area is difficult to reach and navigate unless conditions are extremely dry, and we suspect it may be where roosts are located at present. If we can visit and explore it when leaves are down, we will be able to do a more intensive search for potential roosts. This is a difficult undertaking, especially given that the big trees are more than 100’ tall. On Sunday, we went to Sector 2, the easily accessible part of which has seen a major increase in human activity and four-wheeler use over the last three years. This is the area where the tree on the homepage is located. Because waters were so low were able to get to parts of this sector that we haven’t visited in a couple of seasons due to changes in hydrology caused by beavers and and human traffic. I was sad to discover that what I called the kissing trees, my favorites, have separated. At 11:30, about 4 miles in, Frank nearly stepped on this canebrake rattler, only the third one I’ve ever seen. A few minutes later, a series of approximately a dozen calls from two or three sources caught our ears. We agreed on the following details: they sounded more like “yips” than “kents” (I didn’t consciously remember that Allen and Kellogg described some ivorybill calls as “yips”); they were all single notes with no variations in pitch, perhaps not as rich sounding and higher pitched than the Singer Tract recordings, but with something of their toy horn quality; the first calls came from the east and northeast, and with movement northwestward and away from us. A Downy Woodpecker called shortly afterwards; I mentioned to Frank (and he agreed) that the “yips” had a similar quality to the Downy’s “Pik”, what I’d describe in retrospect as their brevity and emphasis. After the calls subsided, we proceeded north for another hour or so, before looping south and west. At approximately 2 PM and at about the same latititude, I heard three more calls that were more kent-like. Frank missed them; while I suspect they came from Blue Jays, I’m including them for the sake of completeness. On the 17th, I explored parts of Sector 1 I haven’t visited before but did not see or hear anything suggestive of ivorybills. The same was true on the 18th, when I returned to the ‘hot zone’. I don’t anticipate returning to Louisiana until sometime in December but may do another post or two between now and then.